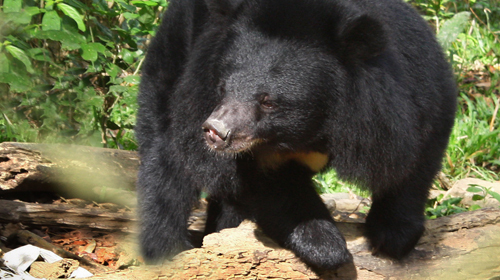 This file photo shows a bear raised in the Wildlife Rescue Center of the Cat Tien National Park in 2012. A Vietnamese agency in charge of wildlife has called on local forest protection units to strengthen control over importing wild animals into Vietnam to prevent the spread of epidemic virus’, including the fatal Ebola virus. >> Vietnam to have first-ever national wildlife park by 2025 >> Vietnam in two minds about destroying wildlife contraband The call was made on Tuesday by the Vietnam’s Branch of Geneva-based Convention on International Trade in Endangered Species of Wild Flora and Fauna (CITES Vietnam), under the Vietnamese Ministry of Agriculture and Rural Development. It came amid worries about the Ebola virus disease that has affected nearly 2,000 people in four West African countries (Nigeria, Liberia, Sierra Leone, and Guinea) and killed 1, 229, as reported by the World Health Organization on Tuesday. In order to prevent the penetration of dangerous virus’, including the fatal Ebola virus, all forest prospection sub-departments in centrally-run provinces and cities must strengthen supervision on the import and breeding of wild animals, said Do Quang Tung, director of CITES Vietnam. Forest rangers should coordinate with local authorities to make plans to prevent the spread of any possible epidemic outbreak among the wild animals raised in captivity in each locality. Acts of smuggling wild animals into Vietnam as well as other violations of CITES and related laws and regulations of Vietnam must be strictly punished, he said. Breeders of wild animals must carry out regular disinfections and sterilizations, as well as other preventive measures in their farms to protect their animals, especially those imported from Africa. CITES Vietnam also asked local authorities to coordinate with veterinary agencies and health facilities to monitor the epidemic situation at farms that include wild animals. All wild animals that die of unknown reasons must be destroyed immediately. Animals falling ill must be isolated and supervised closely, and any signs of infectious diseases must be timely reported to competent agencies for handling.